Geek cultural touchstones merge, clash, and take on disturbing elements in this impressive display of Shaky Kane's considerable talent as the reader is treated to a dystopia that features everything from murderous clowns to the Batmanga version of the Batmobile. I'm reviewing this one not just because it's awesome--it totally rocks my socks--but because it's notable for being the first library book I've checked out in nearly a year. Lord, how I missed being able to randomly grab things and find hidden gems I may have missed for some reason. After losing a limb by going from one of the best libraries in the United States (Shout out to all my friends at the Carnegie Library of Pittsburgh! I miss you!) to a smaller, but pretty good one (Baltimore County), I had the extreme displeasure of finding out that if you weren't clean cut and obviously straight at the Pratt Library, they didn't want to wait on you. After over thirty years of using libraries everywhere from Houston, PA (a small little town south of Pittsburgh) to State College, PA to Reisterstown, MD, I ran into a wall of bigotry in Baltimore, MD and stopped going. I know when I'm not wanted. So it is with great pleasure that I return to using the library again, thanks to the Multnomah County Library, which was friendly and welcoming. May our association be long and profitable for both of us. Did I mention this crazy quilt of a comic was a STAFF PICK? We're going to get along just fine, new library! Anyway, back to the book. 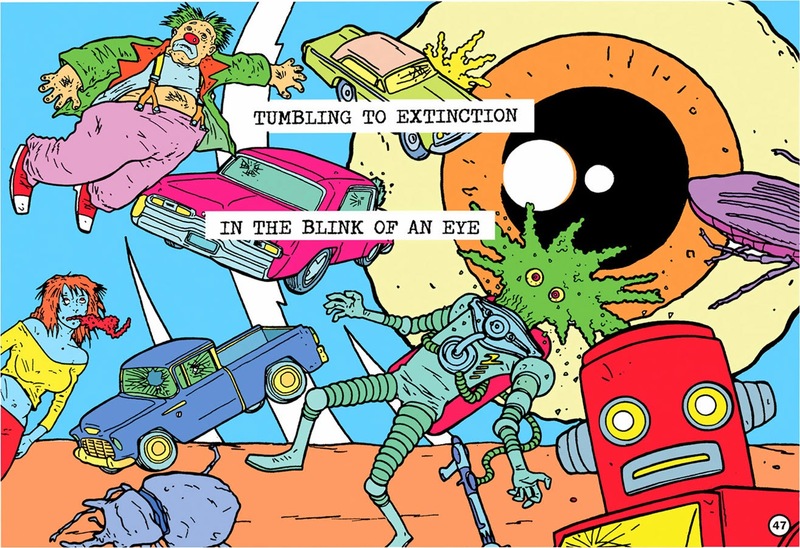 I first became aware of Kane's art when I read the equally quirky and insane mini-series, The Bulletproof Coffin. Working with David Hine, Kane illustrated some of the strangest things I've ever read, and that's saying something. 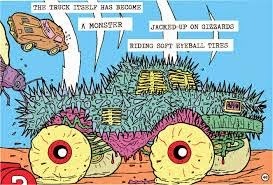 In Monster Truck, Kane flies solo, spending most of his focus on the art and not as much on the text. What words we do see briefly describe the scene, and form a free verse poem that recalls someone's nightmare after watching too many b-movies on television. Slowly progressing across a landscape where giant bugs dwell, vehicles of all kinds (often marked with Japanese graffiti, because why not?) deform or roll across the scene, and iconic figures from horror movies lurk about, Kane's narrative, despite the utter insanity of its words, proceeds clearly and linearly, moving the reader from scene to scene without missing a beat. That steadiness allows Kane to come up with increasingly strange visions, culminating in an ending that leaves the impression that the narrator is stuck in an endless loop of pop-culture nightmare. It could be a great piece of social commentary. Or it could just be a cool way to bookend the story. 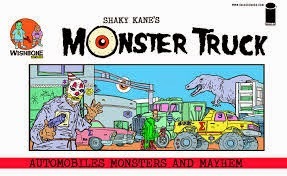 Either way, it's impossible to leave Monster Truck without being impressed by Kane's artwork. He assaults the reader with large, cinematic panels that mix front and center details with little touches that make you want to linger over each page. Just the sheer volume of geeky things in this one is enough to make it worth looking at, as Kane mixes zombies with burning fun houses and even an appearance by a Universal Monster. In the after material, Kane thanks all of the companies he homages here, and it's a very, very long list. The wide variety of creatures and characters allows Kane to show off his range. Some are intricately detailed, such as making the Empire State Building into a Kaiju. Others are more abstract, as children's drawings come to life, looking to destroy. The colors are usually not quite right (Batman is purple, for example), allowing him to emphasize the surreal nature of what is transpiring. The tones are all bright and bold, however, full of pinks, greens, yellows, and other shades that jar as often as the blend. Holding it all together, not unlike the simple narrative text, is a blue sky that never changes, regardless of the scene. 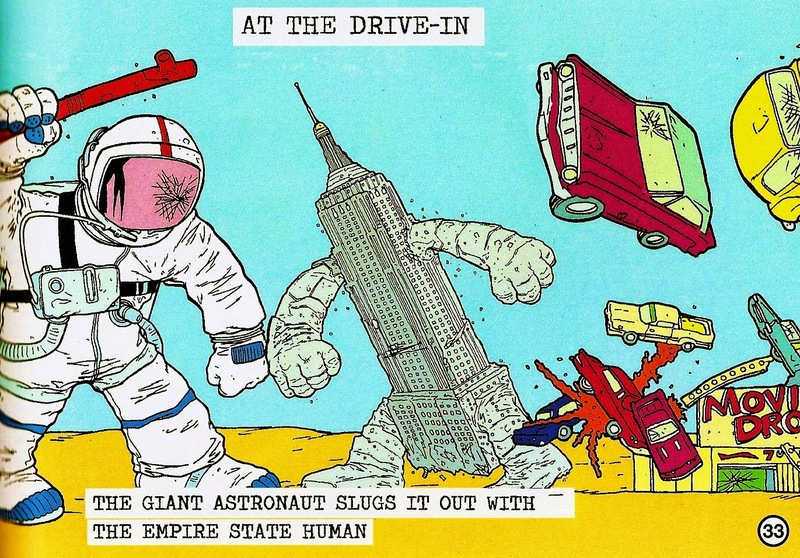 Monster Truck is a work that blurs the line between a comic and an art book. It has a story, but the main draw (no pun intended) is the artwork, which is outstanding. If you missed out on this one, definitely seek it out, because it's well worth it to see how Kane mixes and matches cultural ideas. You might even check to see if your local library is as cool as mine and carries it. Either way, this one comes highly recommended.